It was an important commission. It was for the Capella dei Signore in the Palazzo Pubblico in Siena. In many ways therefore it could be said that at the height of the res publica of Siena, together with worship of Christ, the veneration of Mary lay at the heart of the State. Siena was formally under the special protection of the Virgin. August 15th, the Feast of the Assumption, was the occasion of civic and religious celebrations which extended over three days. 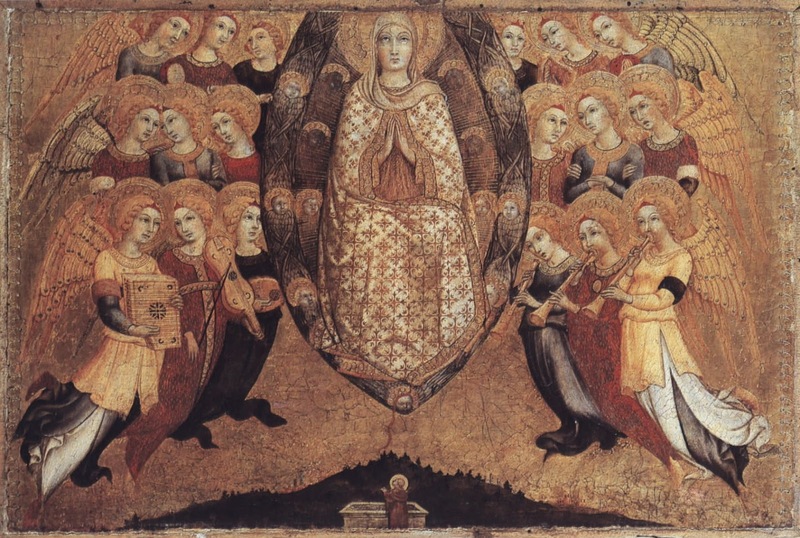 The small figure at the bottom is St Thomas the Apostle ("Doubting Thomas") staring upwards towards the girdle in line with the legend that he doubted also the Assumption of Mary until the belt of the Virgin was let down. He was furnished with the girdle or belt so that he would believe. She is surrounded by cherubim and seraphim. However the predella was replaced in the Civic chapel by a painting by Sodoma and a marble tabernacle sometime in the early seventeenth century . At some time the predella was split up and the pieces were dispersed. Mary does not ascend. She is assumed. She does not will or effect her ascension. She is the object of God`s grace and will. It is only through God`s grace that she was given the privilege. She "rises" because it is God`s will and pleasure. The devotion to Mary causes difficulties for non-Catholics. The Dogma of the Assumption causes more difficulties for those who get past that. Part of the problem is what does the Christian mean by "heaven" ? We leave aside the other related and profound mysteries such as "seeing God", "death" and "eternal life"
Some argue that Platonists aim to ascend by means of their intellectual activity to a tranquil, nonerotic state of contemplation. For the Platonist, there is a need to rise upward, moving from the human experience of love toward its true perfection in the eternal world of forms. It is an intellectual concept. For St Augustine, Christian love is always conscious of the Christian`s sinful state and of his complete dependence on divine grace and being receptive to it. For the Christian, God is both the fount and origin of humanity and its ultimate and final destination. The longing for God, to know, love and be with him, is inherent in our nature and only God can be satisfied by this need. On this earth we know through our bodies, minds and souls. And through Grace the Dogma of the Assumption declares that she attained this knowledge of and union with God and more ahead of any other human being save her beloved Son. "Man, who looked for a superhuman being in the fantastic reality of heaven and found nothing there but the reflection of himself, will no longer be disposed to find but the semblance of himself, only an inhuman being, where he seeks and must seek his true reality. The basis of anti-religious criticism is: Man makes religion, religion does not make man. Religion is the self-consciousness and self-esteem of man who has either not yet found himself or has already lost himself again." 2. Yet in speaking of the light of faith, we can almost hear the objections of many of our contemporaries. In modernity, that light might have been considered sufficient for societies of old, but was felt to be of no use for new times, for a humanity come of age, proud of its rationality and anxious to explore the future in novel ways. Faith thus appeared to some as an illusory light, preventing mankind from boldly setting out in quest of knowledge. The young Nietzsche encouraged his sister Elisabeth to take risks, to tread "new paths… with all the uncertainty of one who must find his own way", adding that "this is where humanity’s paths part: if you want peace of soul and happiness, then believe, but if you want to be a follower of truth, then seek". Belief would be incompatible with seeking. From this starting point Nietzsche was to develop his critique of Christianity for diminishing the full meaning of human existence and stripping life of novelty and adventure. Faith would thus be the illusion of light, an illusion which blocks the path of a liberated humanity to its future. 3. In the process, faith came to be associated with darkness. There were those who tried to save faith by making room for it alongside the light of reason. Such room would open up wherever the light of reason could not penetrate, wherever certainty was no longer possible. Faith was thus understood either as a leap in the dark, to be taken in the absence of light, driven by blind emotion, or as a subjective light, capable perhaps of warming the heart and bringing personal consolation, but not something which could be proposed to others as an objective and shared light which points the way. Slowly but surely, however, it would become evident that the light of autonomous reason is not enough to illumine the future; ultimately the future remains shadowy and fraught with fear of the unknown. As a result, humanity renounced the search for a great light, Truth itself, in order to be content with smaller lights which illumine the fleeting moment yet prove incapable of showing the way. Yet in the absence of light everything becomes confused; it is impossible to tell good from evil, or the road to our destination from other roads which take us in endless circles, going nowhere. 4. There is an urgent need, then, to see once again that faith is a light, for once the flame of faith dies out, all other lights begin to dim. The light of faith is unique, since it is capable of illuminating every aspect of human existence. A light this powerful cannot come from ourselves but from a more primordial source: in a word, it must come from God. Faith is born of an encounter with the living God who calls us and reveals his love, a love which precedes us and upon which we can lean for security and for building our lives. Transformed by this love, we gain fresh vision, new eyes to see; we realize that it contains a great promise of fulfilment, and that a vision of the future opens up before us. Faith, received from God as a supernatural gift, becomes a light for our way, guiding our journey through time. On the one hand, it is a light coming from the past, the light of the foundational memory of the life of Jesus which revealed his perfectly trustworthy love, a love capable of triumphing over death. Yet since Christ has risen and draws us beyond death, faith is also a light coming from the future and opening before us vast horizons which guide us beyond our isolated selves towards the breadth of communion. We come to see that faith does not dwell in shadow and gloom; it is a light for our darkness." "In the Mother of Jesus, faith demonstrated its fruitfulness; when our own spiritual lives bear fruit we become filled with joy, which is the clearest sign of faith’s grandeur. In her own life Mary completed the pilgrimage of faith, following in the footsteps of her Son. In her the faith journey of the Old Testament was thus taken up into the following of Christ, transformed by him and entering into the gaze of the incarnate Son of God."